Sprinkle cooking spray on an iron griddle. Cook the fillets for 5 minutes on each side or until they're cooked to your liking. In the meantime, prepare the French fries and then the eggs. Once the meat it ready, serve on the bread with ham, cheese and fried egg. The egg can also be boiled if you prefer. You can add beets and crunchy bacon if you like. The Chivito is a traditional dish in Uruguay that's usually either prepared as a sandwich or as a dish, like in this recipe. The ingredients can be varied, abundant or alternated. This dish is usually served on a large oval plate that's filled completely and 2 or 3 people could easily eat from it. Though chivito means goat, this recipe is actually made with beef. I do recommend using a good cut like sirloin or fillet. This way you're sure to have tender and juicy meat. It's very similar to the tenderloin sandwich served in Argentina. 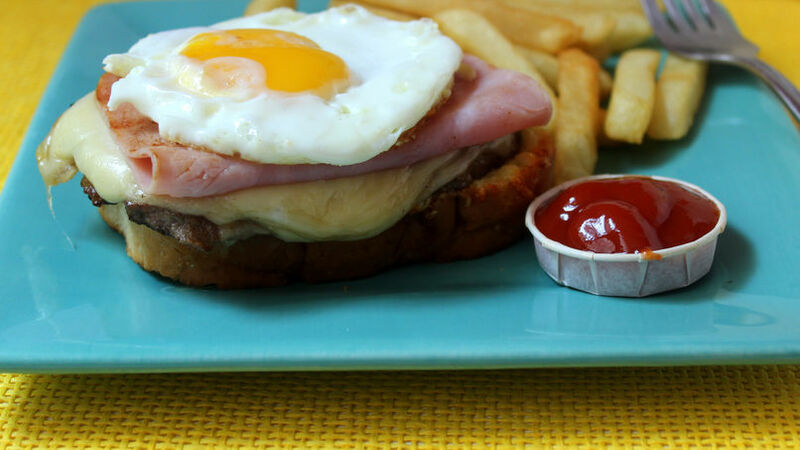 It's also made with beef, ham, cheese and fried egg. Here is my version of this delicious Uruguayan dish.